appears upon startup and exits from the program proper, such that POV-Ray becomes useless (not pleasant when you need that last minute image 30 seconds before lecturing). The error itself is not diagnosed, only noting that a corrupted file is not being accessed upon startup and that running a Disk Utility verification/fixing and reinstalling POV-Ray solves the problem. If this has happened to you, you may have noted that verification/fixing and re-installation does not do the trick. 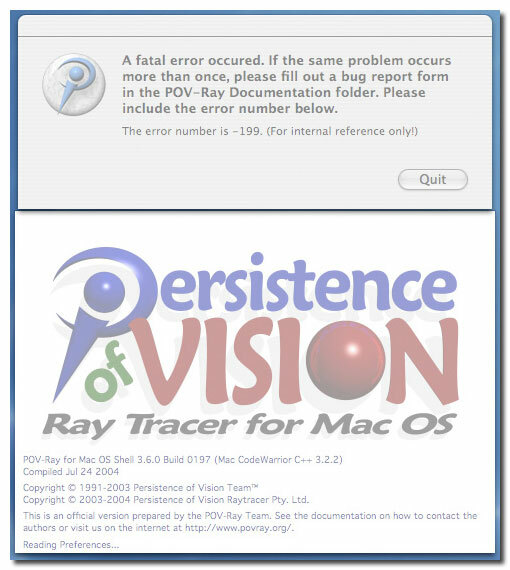 The origin of the problem on my machine could be traced to a crashed POV-Ray rendering run of a number of images and the retention of the file POV-Ray Mac 3.6.plist in my /[USER]/Library/Preferences/ directory, which typically only contains the file POV-Ray Preferences 3.5 (why an installation of POV-Ray 3.6 would still leave a 3.5 Preference file is beyond the scope of this post). Deleting the POV-Ray Mac 3.6.plist file fixes the problem.